Genghis Khan’s larger-than-life reputation began with humble origins in difficult terrain. You might’ve thought the future empire-builder Genghis Khan led a privileged life from childhood. That he came from a powerful and wealthy family and remained powerful and wealthy. Genghis Khan faced many hardships as a child. Born in the Eurasian Steppe between modern-day Mongolia and Siberia, he was given the name Temujin and grew up in a nomadic culture. The nomadic peoples of the area coalesced into tribes and clans based on kinship ties. The head of each clan was known as a khan or chief. But it was a dangerous world. The law of the land was violence. Murder, kidnapping and enslavement between clans were commonplace. Temujin knew this well. His father, Yesugei, had kidnapped Temujin’s mother, Hoelun, soon after she had married Chiledu, a young warrior from another tribe. Normally, men sent gifts to the parents of a putative bride before they could marry, often for several years. Genghis Khan’s father was too poor to afford such luxuries, so he simply carried off Hoelun for himself. Hoelun gave birth to Temujin in 1162, far from her family and home. Soon after, Yesugei was killed, and the tribe cast the boy, his mother and his siblings out to die on the steppes. It was only through sheer determination that they managed to survive. Temujin was never formally educated. He made his own way in a tough environment – and it was brutal. For instance, when still a child, he killed his older half-brother to secure control of their family. Temujin was also later captured and enslaved by a rival tribe, the Tayichiud. Fortunately, he managed to escape by sequestering a horse and riding home. Genghis Khan could be seen as both a genius and the victim of a smear campaign. Genghis Khan’s domain was vast – almost beyond imagining. Genghis Khan established a unique code of laws to govern the empire. Genghis Khan advocated human rights and education. Genghis Khan based his empire on meritocratic ideals. The Mongols were essential in creating what we consider modern civilization. 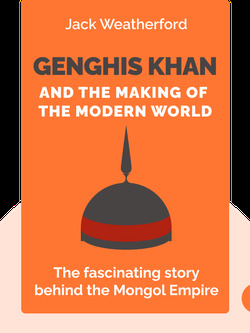 Start your free Blinkist trial to get unlimited access to key ideas from Genghis Khan and the Making of the Modern World and over 3,000 other nonfiction titles. With bitesize text and audio, it's easier than ever to find the right ideas to transform your life.